I am wondering when the IFCA started doing Junior All-State. The IFCA website goes back to 2001, maybe it was then? IDK, any help would be appreciated. Thanks. 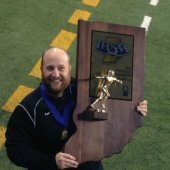 have you checked out our man @Rudy indiana almanac site? Just did, it may be worth the $$ to get the book, goes all the way back to 1906. If your a history nerd like me, that would be a good/fun resource to have. The IFCA website definitely goes back to 2001. My junior season, we had a kid make Junior All-state. That would've been '99 so at least that long. The book only covers first team all-state players. To add junior, 2nd team, academic, etc. would have made this already long project impossibly longer. Maybe one of these days though lol. I'll see if I can get an answer for your question though. Was there someone in particular you were curious about? Probably still worth the $$. I cannot imagine the amount of research it took to put that together, especially with limited online resources. Agreed, adding all that would be a nightmare of a task. I was just curious when the IFCA started doing their Junior All State. I am interested in any MSC or PLAC players, no one in particular. Just being a football nerd lol. It took years to gather the data (my newspapers.com account helped a ton) and about as long to format the info into book form. The book doesn't have a conferences section but the new edition does have it broken down by school (plus by year and by last name). Also, I donate 10% of all proceeds to the gridiron digest if a forum member buys and lets me know.